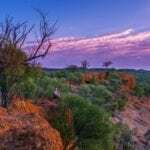 Tucked within the Carnarvon Ranges with priceless cultural treasures, primitive plants and dramatic sandstone escarpments, one thing’s clear: this is no ordinary cattle run. Is this a rock wall or a time machine? Facing a sandstone overhang on Wallaroo Station in Central Queensland’s Carnarvon Ranges, I feel it could almost be a couple of thousand years ago – the ancient artworks stencilled in ochre here seem so fresh and alive. This is Rainbow Cave, an astonishing legacy from a mysterious corner of Australia’s past. Outlines of human hands – even a full body stencil – adorn the rock face, along with a smattering of paintings, such as kangaroo testicles and even a European-style axe. What does it all mean? No one knows for sure. The traditional owners have never been identified, cultural continuity severed by colonialism long ago. And it’s far from the only Indigenous site on the station; another called the Axe Factory, for example, has hundreds of rock grooves indicating major blade-sharpening activity. It might seem amazing that such priceless cultural treasures exist on a privately owned cattle run, but this is no ordinary farm and getting here with Boobook Ecotours (boobookecotours.com.au) is no ordinary tour. 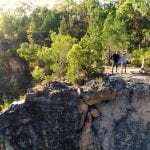 It’s heavily forested, huge and filled with secluded gorges and caves – much like the rest of the Carnarvon Ranges, a region blessed with one of the world’s greatest concentrations of Indigenous stencil art. Flying in by helicopter from Roma (160km south) affords an unforgettable idea of the sheer size and isolation of this country. As we approach, cleared flat paddocks give way to increasingly forested hills, with the eastern edge of Wallaroo skirting the dramatic sandstone escarpments bordering the neighbouring Arcadia Valley. 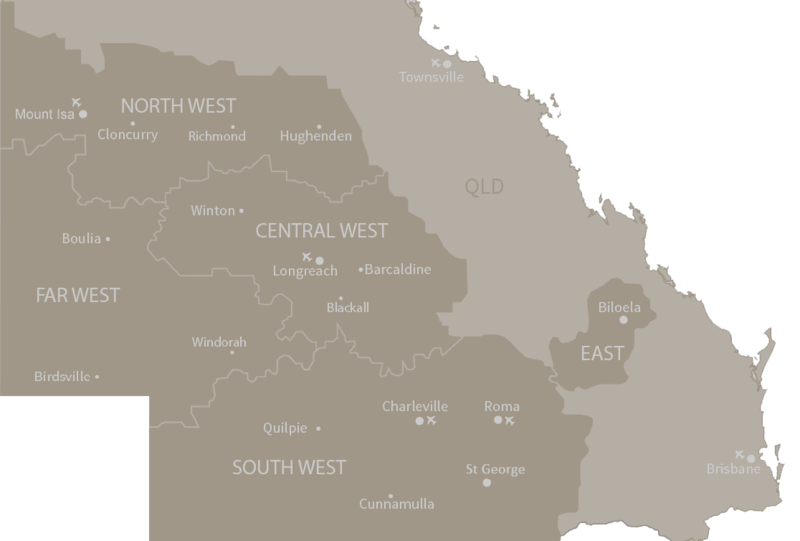 Altogether Wallaroo encompasses 71,000 acres – nobody talks hectares out here – almost twice the area of metropolitan Sydney. Wallaroo is also easily accessible by road, along the Great Inland Way (Carnarvon Highway) between Injune and Rolleston. It’s remote but we’re not roughing it. The Wallaroo Outback Retreat consists of eight glamping safari-style tents, all on wooden decks with framed beds and quality linen. Close by, a reception centre includes flushing toilets, showers and a kitchen. There’s even Wi-Fi. The best way to take an in-depth scout about the property, however, is with Craig Eddie of Roma-based Boobook Eco Tours. You don’t have to stay at the Retreat to join a Boobook day trip to Wallaroo, but it’s the only way to see the best of the station. 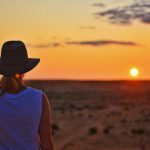 With wildly weathered sandstone formations, weird and primitive giant cycad plants, Aussie wildlife galore and Aboriginal cultural sites par excellence, there’s plenty to take in. Craig, an ecologist by trade, talks us through all the changing terrain – ironbark woodland, dry eucalypt rainforest – and identifies flora and fauna for us, including five kangaroo and wallaby species. We stop off at choice vantage points over the Arcadia Valley – lush farmland only opened to agriculture in the 1960s – to marvel at looming towers of sandstone with evocative names, such as The Sphinx. Morning tea sees us in Cycad Grove, an extensive forest of macrozamia cycads, primitive palm-like vegetation that exudes a strong dawn-of-time vibe. In fact, cycads are often called ‘dinosaur plants’, being the dominant vegetation back when the world was a real-life Jurassic park. It looks like it still could be, in this secluded macrozamia metropolis framed by tall sandstone walls. Cycads are everywhere, but the crowning glory is The Arch, a weathered rock outcrop standing like a thick-thighed giant, legs apart, turned to stone but poised to galumph its way out of the gorge should thesome spell be lifted. But then there’s something enchanting about this whole country – I’m feeling spellbound by it myself. We finish up at Rainbow Cave. 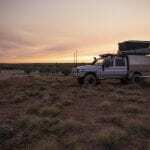 “We make sure these sites are never desecrated,” says Wallaroo station owner, Justin MacDonnell, whose determination to protect his environment, natural and cultural, is unwavering. One day he hopes to be able to invite Indigenous custodians here, should they ever be found. We may not know exactly why those hands were painted, but as captured moments from real lives lived, they are moving in ways unconnected with rite or symbol. They simply mark a day, perhaps much like this one, when living hands like ours, from the world’s oldest living culture, pressed against rock to reach us across all of recorded time. Getting there: Qantas flies direct to Roma where you can join Boobook Eco Tours.